Nature & Forest Therapy Walks. Workshops and Experiences. 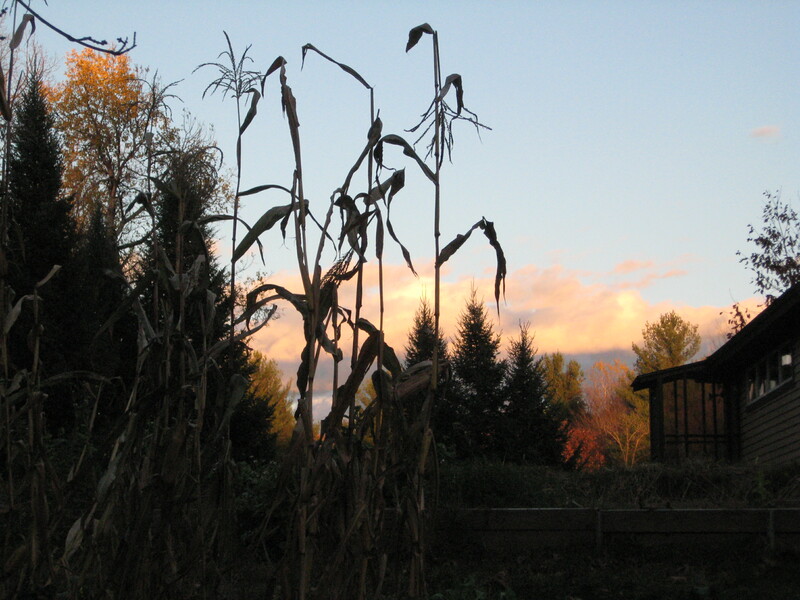 Where you can write and learn in the beauty of fall, at Still Point Retreat Center. One Day or Two Day options available. Come and experience how movement can assist your writing in a relaxed environment, with periods to write built into the day. This workshop-retreat offers an excellent opportunity for work on a new or ongoing project (e.g. fiction, memoir, poetry, personal journaling), as we experience the fall weekend that includes Dia de los Muertos, All Saints/All Souls, Celtic Samhain (end of harvest) and the beginning of National Novel Writing Month. You can attend Saturday, Sunday, or both days. Where is it being held? 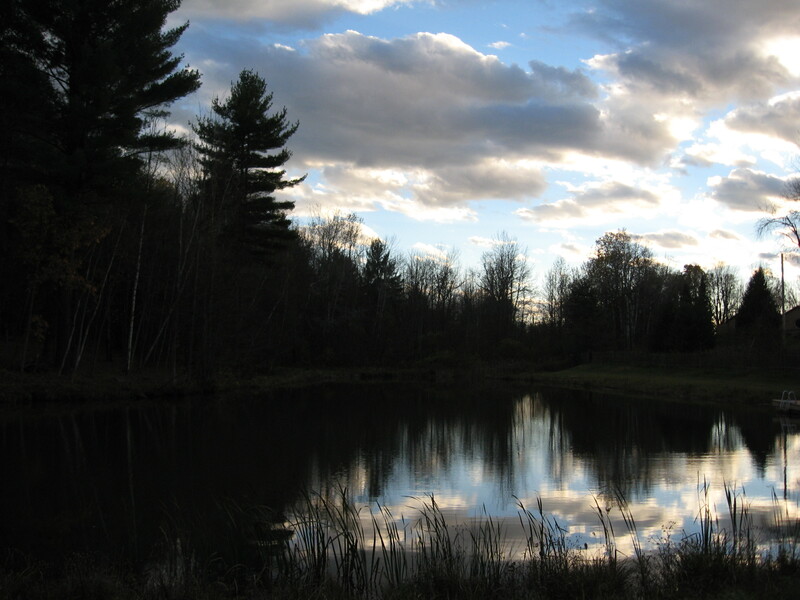 Still Point Retreat Center is a small-scale, homey/comfy retreat center with a spiritual emphasis, in Stillwater NY, very close to the Saratoga Historical Park, 30 miles north of Albany. You can commute to the workshop or stay at Still Point. How much will it cost? $59/1 day, $118/2 days, including options to experience a yoga class, labyrinth walk and other moving meditation, while supplied with noshes throughout the day. Limited income/NANOWRIMO* participant $29/ 1 day, $58/ 2 days. Accommodations are a separate charge and should be arranged directly with Still Point. Visit the Still Point website at http://stillpointretreatcenter.com for pictures and information about the cabins & rooms and to sign up for housing. In conjunction with this retreat, you can opt to stay over Friday, Saturday and/or Sunday nights, depending on what rooms are available at the time you book your accommodation with Still Point. Included each day in your workshop fee: healthy & tasty breakfast foods in the morning, tea and coffee over the day, home made soup for lunch. If you are staying over, dinner will be shared potluck and the evening will be free time (ideas: write, visit with others, rest, walk on the grounds or read). How do I sign up for the workshop? This is deliberately a small workshop so it is advised to sign up as soon as you know you’d like to come. First, let us know you are attending and which days, through the Contact Us page on this website, and second, mail a check to Of-the-Essence Holistic Wellness, P.O. Box 1344, Troy NY 12181 or contact us for cash payment options. Evening at Still Point. Can’t you see yourself here? 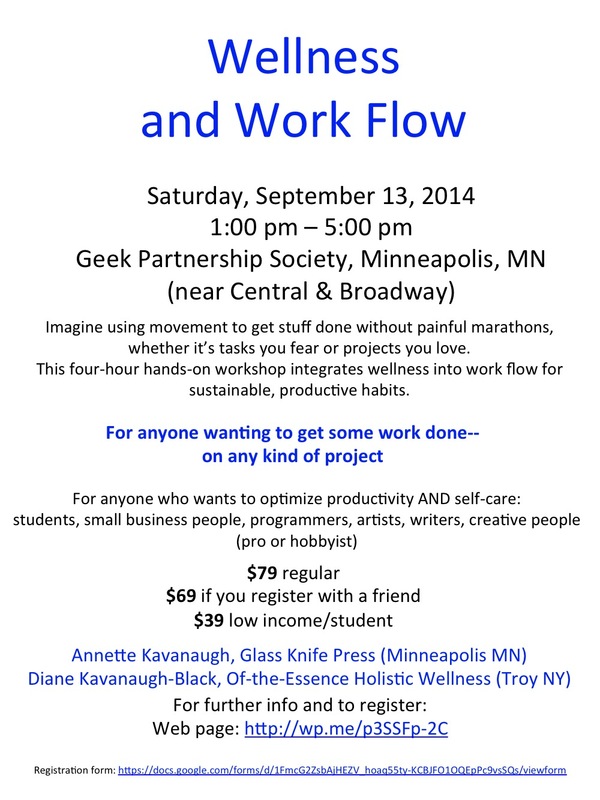 (Please note this workshop is being held in Minneapolis, MN.) You can register for the workshop here. As independent business people and artistic entrepreneurs, we’re exploring new territory every day. We’re both trained in wellness disciplines (massage therapy, yoga, martial arts, theater) with academic background both in STEM (mathematics, computer science, physics) and humanities (English, philosophy, visual arts, theater, creative writing in both fiction and nonfiction). We bring to our coaching practice both direct experience and rigorous training to help community members and students make the most of their role as self-employed creative practitioners. For those of you who are students, we bring our own experience of graduate and professional school*. We’re familiar with the stress and the glory, the emotional ups and downs of original research, and the time management challenges. (*as graduate student, students in vocational certificate programs, and as support/partner to friends/family in graduate/professional programs, among them MDs; PhDs in Microbiology, English, Biomedical Engineering, Mathematics, Public Health; Masters in Pastoral Counseling, Theology, Social Work). Between the two of us, we have over seventy years’ experience learning (including self-teaching), instructing and coaching. We’re here to help you bring your own considerable powers to not just enduring but flourishing, both individually and collectively. We understand the power of cross-disciplinary and cross-cultural collaboration. Annette Kavanaugh, Creative & Technical Director at Glass Knife Press (Minneapolis MN), received a Masters in Mathematics from University of Minnesota. During her academic years and when she worked as a data analyst and project manager, she developed the effective methods for self-teaching she now coaches. An independent artist, performer and writer, she is co-founder and facilitator of the Big World Writing Club, a multicultural, multidisciplinary, multi-genre writing community organized around practice. She most recently worked as Coordinator of the Instructional Center at the Multicultural Center for Academic Excellence, University of Minnesota, where she recruited, trained and supervised a talented multicultural staff of tutors in mathematics, physical sciences, biological sciences, and East Asian, North American, and European languages. Diane Kavanaugh-Black, owner, Of-the-Essence Holistic Wellness (Troy, NY) is an essayist, memoirist and photographer who ran a thirteen year massage therapy practice in Chicago before training at the Kripalu School of Yoga in Massachusetts. She taught Community Education classes starting at age 16, and has done extensive volunteer and paid academic tutoring ever since, including adult literacy and assisting artists with vision statements. Diane is co-founder and member of multiple writing and editing work-groups and has been chosen to perform her writing at The Arts Center of the Capital Region, the Rensselaerville Festival of Writers and on WAMC public radio. She has a BA with Honors from University of Chicago, and combines yoga, writing, hiking and healthy cooking in her current business in upstate New York.